Available for $1795 + $360 per year. SOX Check Approval extends the Sage 300 check management process. 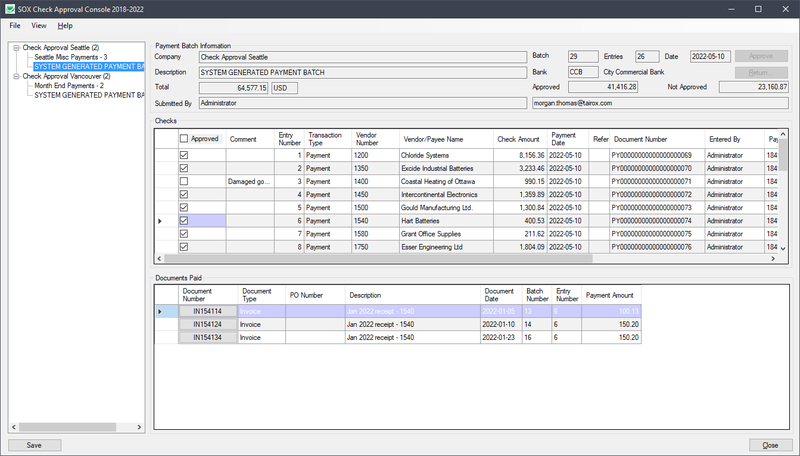 Checks for one or more companies are approved by executives from an easy-to-use, central console. Payment batches are prepared by staff and submitted for approval. One to Three levels of executive approval are required. Unapproved checks are removed from the payment batch and approved checks are released for printing and distribution. Integrations with Altec DocLink, Orchid Document Management Link and docSTAR Eclipse are available (requires an additional license of $995 + $200/year). Approvals are defaulted if functional currency amounts are less than a configurable amount. A complete audit log is maintained of all submission and approval activity. • Users at lower levels of approval can, optionally, approve batches if all checks are within their allowed limits. • When a payment batch is finally approved, any declined payments in that batch are (optionally) put into a new batch that can be re-submitted. A setup option controls this behavior. • The email subject field will now substitute 12 different codes with company dependent values so that, for example, the company name and batch description will appear on notification email subject lines. • When Sage 300 users look at a batch In Progress, the various level of approval and the user approving will be shown. • After a batch is approved, the Approved button will still be active and will show the complete history of the approval, including the users who approved at each level. • Notification emails now contain the users who have, at the current stage, either approved or returned a batch. • All payment, approved payment and declined payment totals are displayed at the top of the console page. • Companies and batches are displayed in an easy-to-use tree view. • A 1-level, 2-level or 3-level approval process can be defined per company. • Batches can be sent back a previous approval level or all the way back to batch entry. • When a batch is approved, unapproved checks are removed from the batch and the batch is released for printing in the source company. • An audit log of all approval submission and approval activity is maintained. • Integration with Altec DocLink, Orchid Document Management Link and docSTAR Eclipse is provided (requires additional license). • Accounts Payable Payment Batch List and Payment Entry functions are replaced with versions that restrict the entry, approval and printing of checks. 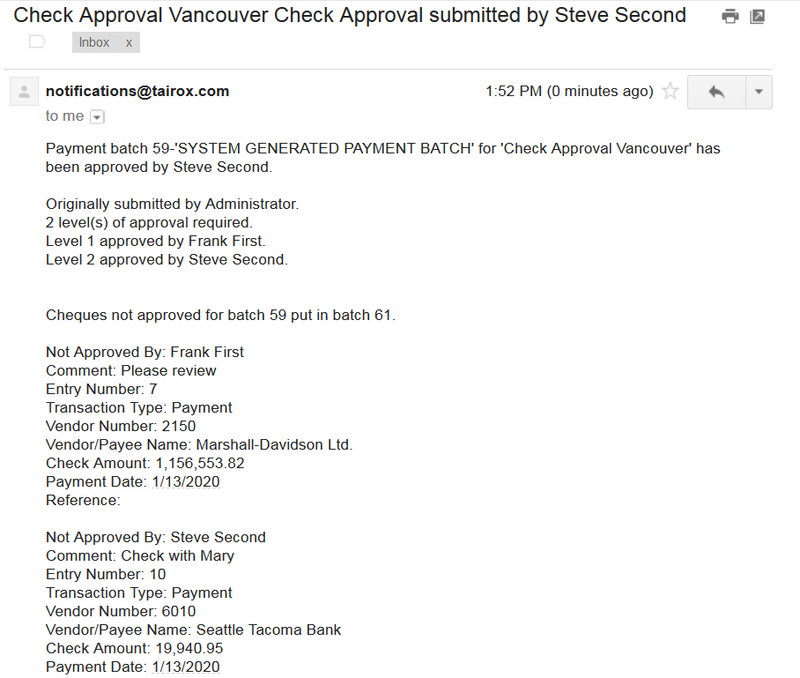 • A "Submit for Approval" button puts a batch into the "Check Creation in Progress" state, which stops further modification of the batch by staff. 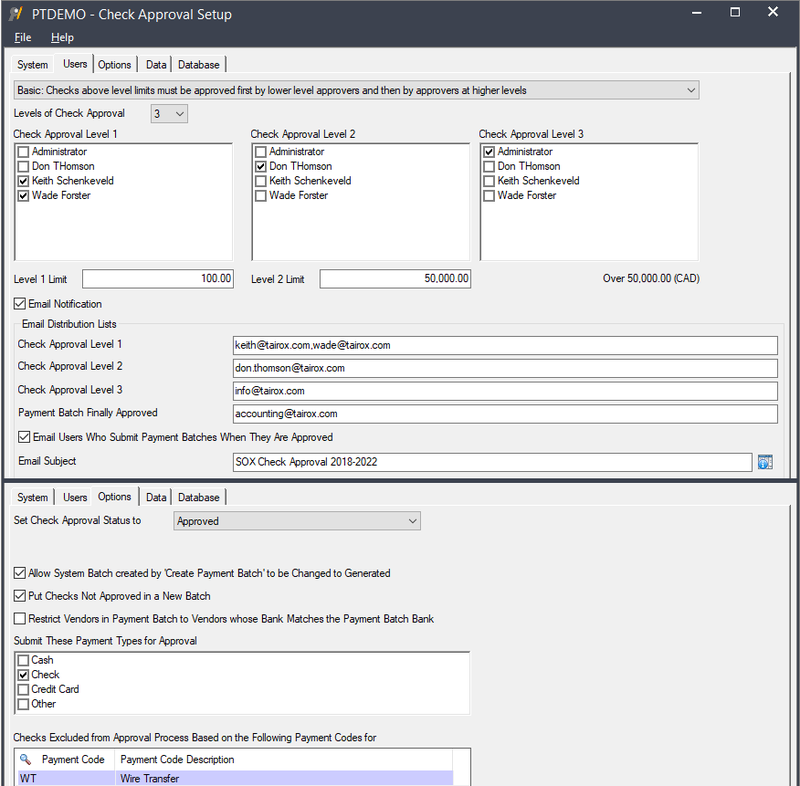 • When a payment batch is submitted for approval, the batch and its entries are copied from the source company into an Approval Database that is managed by the Check Approval Console. • When a payment batch of type System is submitted for approval, a prompt will allow users to change the type to Generated - so that another payment batch can be generated during the approval process. • A system administrator can set up executive access and passwords, which are then encrypted and stored in the Sage 300 shared folder. • Companies can be set up so that lower levels of approval can approve checks within level limits. • A "payment codes excluded" list is maintained per company. These codes are excluded from the approval process. For example, a "wire transfer" may be part of a payment batch and has already been sent - it is not, therefore, a check to be printed. • A status display is available to assist administrators. All batches and all checks can be displayed in a grid. • The check approval database tables are created programatically. System Overview - The use of SOX Check Approval is described in 3 documents, each one targeted at a different kind of user. 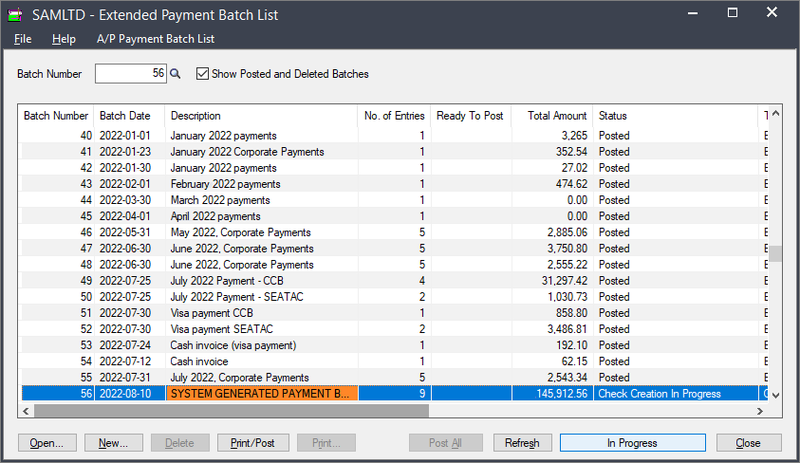 • Extended Payment Batch List User Guide is a document written for users of Sage 300 who prepare payment batches and submit them for approval. • Check Approval Console User Guide is a document written for key users who will perform a 1, 2 or 3-step approval. These users may not be familiar with Sage 300. • Check Approval Setup User Guide is a document written for system administrators who setup databases and configure the solution. Important Note: Reinstalling Desktop Menu Control to remove standard icons is required after performing any Sage 300 update.